Submitted by College Park Arts Exchange, one of CPCF’s first grant recipients. 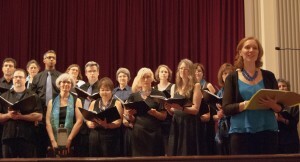 In 2013, CPCF awarded a grant to CPAE to fund sheet music for its new adult choir, the College Park Chorale. The College Park Chorale, directed by Allison Hughes, has completed its third year with a celebratory concert held at the University of Maryland Memorial Chapel on May 16, 2015. 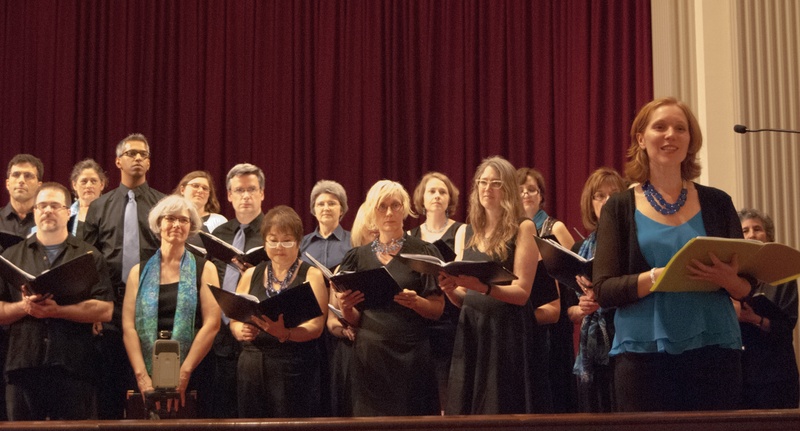 As a community choir, College Park Chorale gives singers the great joy of making music together with their friends and neighbors. It also brings together cheerful amateurs with singers who have had more extensive training and performance experience. No audition is required to join the Chorale, but Ms. Hughes has succeeded admirably in melding a diverse group of forty singers into a skillful choir. An original setting of “Peace Like a River,” by College Park composer Dr. Gabriel Ruiz-Bernal, was the tour de force performance of the concert. Dancer Laurie Sanda interpreted the piece before the audience with a long blue scarf which helped to represent peace like a river, joy like a fountain, and love like an ocean. This challenging contemporary composition demanded mastery of complex melodic and harmonic lines from the choir. Dr. Yee Von Ng, accompanist, supported the Chorale adroitly on piano, for this piece and throughout the concert. There was a wide variety of musical styles were represented in the concert though all the pieces had a common theme of water. From the premiere performance of Ruiz-Bernal’s contemporary composition “Peace Like a River” to Renaissance madrigals alluding to the ocean and weeping, to modern settings of folk songs like “Shenandoah” and “The Water is Wide” and new arrangements of popular music such as “7 Bridges Road” and “Bridge Over Troubled Water,” the audience was lead through a wonderful breadth of material. Several songs featured the talents of strong soloists, as well as instrumentalists playing guitar and violin. Tying into the water theme, the Chorale partnered with Saha Global, a non-profit working to find local solutions for clean water and electricity in Ghana. The chorale is grateful for the support of many volunteers and local groups that helped to make this concert a success. The College Park City University Partnership and the University of Maryland helped to secure the beautiful UMD Chapel as the venue. College Park Community Foundation helped stabilize the Chorale in early days by helping to defray the cost of purchasing sheet music. This entry was posted in Grants and applications, Other community events by jackie. Bookmark the permalink.